Generating recombinant protein requires the use of an expression host and E. coli is usually the top choice for this purpose. A combination of simple genetics, ease of culturing, fast expression and high yields makes it an attractive host while the lack of an efficient post translational machinery, codon usage bias and difficulty in producing higher molecular weight proteins, makes it disadvantageous. However one of the biggest evils in E.coli expression is insoluble expression – the phenomenon in which recombinant overexpression results in the formation of insoluble protein aggregates called inclusion bodies. When inclusion bodies form, scientists usually try a cumbersome process called in vitro protein solubilization and re-folding to recover soluble protein or they try expression optimization at the process or molecular levels to prevent insolubility issues [recently, there has also been a great deal of interest in the direct use of inclusion bodies as sources of pure, functional proteins for a variety of biomedical applications]. Examples of process level optimization include methods that do not require target engineering. For example optimizing the expression conditions, adjusting the growth and induction conditions, changing media, buffers etc. An alternative would be to try out a molecular approach and manipulate the target protein by eliminating undesirable elements within its sequence by creating truncations or mutating certain amino acids to make the protein more soluble. You could also adopt a rational, site-directed mutagenesis approach based on structure information or take a directed evolution approach and screen for the solubility of random point mutants, deletions and fragments. A better, easier approach would be to adopt a fusion partner strategy and use an upstream fusion partner that would make the target protein more soluble. 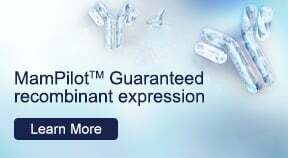 Using this approach, a difficult-to-express protein or peptide is fused to another, stable, highly soluble protein in order to stabilize expression, with the idea that the fusion protein will drive the resulting expression. Although many proteins are highly soluble, they are not all effective as protein solubility enhancers. In this regard, Maltose Binding Protein [MBP] can be a very useful protein solubility partner [MBP tag]. In a comparative study geared to investigate their protein solubility enhancing properties, E. coli MBP tag proved to be a much more effective protein solubility partner than the Glutathione-S-transferase (GST) and Thioredoxin (TRx) proteins. MBP is an approximately 42 kDa, naturally occurring protein in E. coli, encoded by the malE gene, which is responsible for the uptake, breakdown and transport of maltodextrin, a carbohydrate. 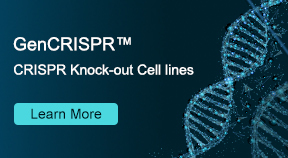 Originally developed as a protein expression tag in the 1980s, it is known to significantly enhance the solubility of a variety of downstream-fused, target proteins. While the exact mechanism of protein solubility enhancement by the MBP tag is unclear, it is known to stabilize and protect its downstream passenger protein from proteolytic degradation during and after protein synthesis. Cytoplasmic yields of MBP-fused proteins are also usually higher because the fusion protein provides reliable contexts for efficient translation initiation. It is also proposed that the MBP tag might act as a chaperone by interactions through a solvent exposed hot spot on its surface which stabilizes the otherwise insoluble passenger protein. Figure 2: A general schematic for construct design strategy – affinity/solubility tag combination at the N-terminus, proteolytic cleavage site followed by the target protein can give good results, especially for insoluble target proteins. A linker sequence [a combination of Glycine and Serine, usually 6-8 amino acids] can often help with proteolytic cleavage issues. Other than protein solubility-enhancement, another advantage of using an MBP-fusion strategy is to facilitate purification of the downstream target protein. MBP is a natural affinity tag that binds to amylose resin and it can be utilized for single-step affinity purification by binding to cross-linked amylose. MBP tag-fused recombinant proteins bound to immobilized amylose are typically eluted under non-denaturing conditions using maltose [usually 10mM]. 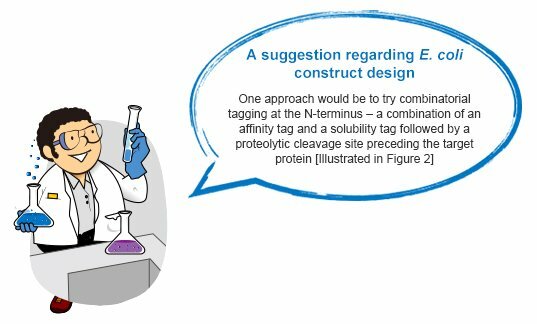 While there isn't a simple, global solution to address the insolubility issues in E.coli expression, a well-engineered construct and carefully-crafted expression strategy can give you the desired soluble protein. MBP is a reliable solubility tag for recombinant soluble protein production and while solubility is one of the most important elements of a protein production campaign, the end goal should not always be about solubility. Expression levels, protein activity, purity, homogeneity and stability are all important factors that must also be taken into consideration before embarking on a recombinant protein production campaign. Esposito D, Chatterjee DK: Enhancement of soluble protein expression through the use of fusion tags. Curr Opin Biotechnol 2006, 17:353-8.184. Fox JD, Kapust RB, Waugh DS: Single amino acid substitutions on the surface of Escherichia coli maltose-binding protein can have a profound impact on the solubility of fusion proteins. Protein Sci 2001, 10:622-630. Planning on a Bacterial Expression project? 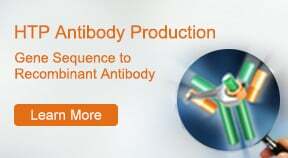 Get a Free Quote within seconds for our BacPower Guaranteed protein expression packages.